Last year we reviewed Eaton’s 5130 UPS and it was almost perfect. 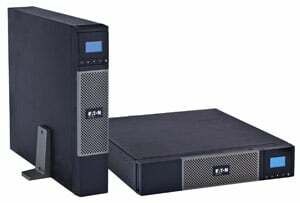 Today Eaton announced the new 5PX UPS to replace the 5130, and hopefully improve it. One of the key new features of the 5PX line is energy consumption metering down to the outlet group level; this is an industry first. Also included is an intuitive LCD screen that displays all the information IT managers need in one quick glance. Energy consumption levels as well as a wealth of other information can also be viewed via Eaton’s Intelligent Power Manager software. This new 5PX line will range from 1.5kVA to 3kVA and can provide up to 99% efficiency to help reduce cooling and utility costs. It also sports a power factor of 0.9, which allows it to protect more servers or devices than the competition. That’s nice because typical UPS power factor ratings are around 75% or 0.75; the higher the pf the better. All of the Eaton 5PX UPS units can stand in pedestal mode or be rack-mounted (2U) with the included rails. We are currently evaluating a 5PX 5PX1500RT , the 1500VA version, so stay tuned for a full review coming soon. I would be more likely to go with a Liebert GXT3 model since its a true on-line UPS system and not a line interactive model as the 5PX. On-line with no switch-over time and AC power converted to DC and back to AC is cleaner power to my loads. Can this Toshiba Satellite be saved?